Winter has arrived, but spring will be here quicker than you think! If you are like us, when you’re not on the ice chasing walleyes, you are using this time to spool new line on your reels, reorganize tackle, and sort out all of the odds and ends that somehow made their way into the glove box of the boat over the summer! The off-season also means it might be time to check out electronics options for anyone buying a new boat or anyone who is looking to upgrade their current sonar and or GPS unit. When we first started fishing for walleye, our sonar was the “Green Box” and our “GPS” was using our eyes to triangulate a tree, a silo and a house to put our boat in the general area that we wanted to be. We marked “waypoints” by throwing out a marker buoy once we found a school of fish or a piece of structure. The first is having a color screen. Most electronics now come with color screens that show the bottom in yellow with a thin blue line. You can change these colors by selecting a different “pallete,” but for this article we will talk about the colors that show up on the default pallete for a Lowrance unit. A strong sonar echo (hard bottom) shows up as a wide bright yellow area, while a softer echo (mud) will show up with red or blue intermixed in the yellow. The colors make it easier for you to distinguish fish from structure and the bottom. Often a walleye tight on the bottom will show up as a yellow bump, but just below the bump will be a thin red line showing separation – that’s a fish! On non-color units, it is hard to tell the difference between various shades of gray that represent the fish, structure and bottom. Next, your unit should run with minimal adjustments straight out of the box. The bottom of the screen should be bright yellow and the blue line representing the bottom should be crisp. Bigger fish should show up as arcs surrounded by red with a yellow middle. If this is not the case, turn up the sensitivity to show a little bit of clutter in the water column. This should make the yellow appear sharper. Finally, it is important to have a good chart scroll speed and ping speed. The faster the chart scrolls, the more pixels are turned on as the fish passes through the cone, giving you more detail about what’s happening below the water. This speed will also let you search faster but still show you the clues to tell you fish are present. Most units have the GPS built right in. In addition to saving waypoints, the GPS can help you follow contours to find fish that are relating to breaks and humps. While some units come with preloaded maps, you can also purchase a chip containing maps to insert into your electronics. For many lakes, these maps will help find great areas before you even get on the water. Look for sharp breaks close to deep water, feeding shelves and even expansive mud flats in the 20 to 30 foot range. One reason to consider a higher end unit is that the computer processor inside the unit will update these complex maps on your screen much quicker. Plus if you want to scroll to different areas of the lake, the faster units will more quickly draw all the mapping contours. 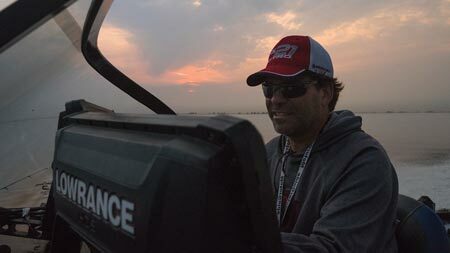 One feature that is becoming more prevalent is the ability to control an electric trolling motor from the fish finder. The GPS functions on the Lowrance HDS integrate with the Motorguide Xi5 bow mount trolling motor. What does that mean to an angler? One example is for you to locate a piece of structure from the unit on your console that looks fishy – maybe a windblown point. With the Motorguide Gateway, you can move the GPS cursor just upwind of the spot then press a few buttons and tell the Xi5 to “Anchor at Cursor.” If the approximate positioning was not just right, you can also use arrows on the HDS unit to jog the trolling motor to just the right position. So how do you decide what size unit is right for you? That depends on your needs and your budget. The price of the unit within each series is dependent on the size of the screen and the processor needed to drive that screen. The transducer, sonar technology, and GPS technology are all similar from model to model. If your unit is being used strictly for ice fishing, a Lowrance Elite 5 is a good choice because you only need to view one screen at a time. While you are jigging you can watch the sonar screen and when you decide to travel to another spot you can switch over to the GPS screen. If you are putting a unit on the console of your boat to use while you are searching for fish, you will want to choose an Elite 7 or 9 or a Lowrance HDS 7 or HDS 9. This will allow you to run a split screen showing both the sonar and GPS at the same time. You will need to go to a bigger unit if you want to be able to see multiple views of what is under the water by watching several windows on the screen at the same time. Some of these views might include GPS, conventional sonar, SideScan, DownScan, 3D StructureScan and one window might even have controls for the Xi5 Motorguide bow mount trolling motor. This requires a minimum of an HDS 9 or HDS 12. The option we use is to mount two units on the console – just so we can see all the data at a glance. You also have to take into consideration how far away you will be from the electronics in your boat and how much you need to see from a distance. Are you usually at the console while trolling? Can you see the detail you are looking for when you are by the transom? The second area on a boat that needs a unit is the bow. We recommend a minimum of an Elite 7 or HDS 7 (if you just want to split the screen with conventional sonar and GPS), all the way up to an HDS 12 (if you want to have more windows showing more data). Remember, it is all about visibility! Once you have found the electronics that are right fit for your needs, take some time to view videos on the internet, read articles and talk to various pros at sport shows to learn more about how they use different features on their GPS and sonar in different situations. Before you know it, the ice will be breaking up, the ramps will be open and you will be prepared to find your Next Bite!